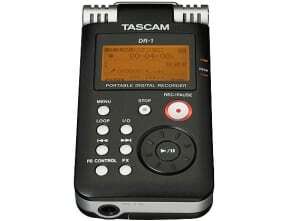 TASCAM has revealed a new recording device called the DP-004 Digital Pocketstudio, the DP-004 is a portable four-track digital recorder. TASCAM has more than 30 years of Portastudio innovation, the DP-004 maintains their legendary ease-of-use of cassette-based four-track recorders but enhances it with CD-quality digital recording technology. Instead of confounding menus and windows, the Pocketstudio uses a set of dedicated buttons and knobs for easy operation. A pair of unbalanced 1/4″ inputs accept line or mic signals, or musicians can employ the nifty little built-in stereo microphone. 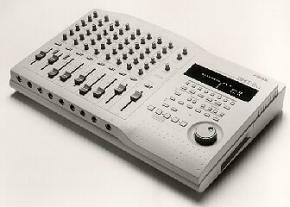 In addition, a stereo mixdown track is also included, and tracks or mixes can be easily transferred to a computer using USB 2.0. Another thing that we find cool about the DP-004, it’s smaller than a paperback book and is portable enough to bring anywhere. The DP-004 records to an SD Card, TASCAM also was kind enough to include a 1GB media card with the device. It features autopunch recording, track editing and an undo function. A tuner and metronome are built-in, and the Input “A” jack accepts a guitar-level signal for direct recording. The DP-004 will be available in November 2008 with an estimated street price of $199. For more information, visit their web site at www.tascam.com. I am compelled to write a review for this thing despite my strict moral code regarding the promotion of any part of the free market system. POV: I’m a hack. Big pedal chain, lotza instruments, down tempo, loopy, stoner stuff. I love knobs and I hate ‘menus’. This 4-track was made just for me. No need to read the instructions. They will only confuse you. The basic operation of this little guy (tracking, mixdown, mastering, and exporting to yer pc) is just like the ol’ ‘tascam porta2’ cassette 4-track. The only bummer is they didn’t include eq pots. You just have to get your tone right going in. The onboard stereo mics sound soooooo good. Super quiet w/ variable gain. I’m in love with a machine. Thank you for your comment. I, along with our GEAR-VAULT readers find your user review a very useful benefit when doing research. By the way, your artwork is amazing! Again, thank you for contributing to GEAR-VAULT. Good review sovietcong. I just ordered on of these and I can’t wait to get. Your artwork is awesome too!